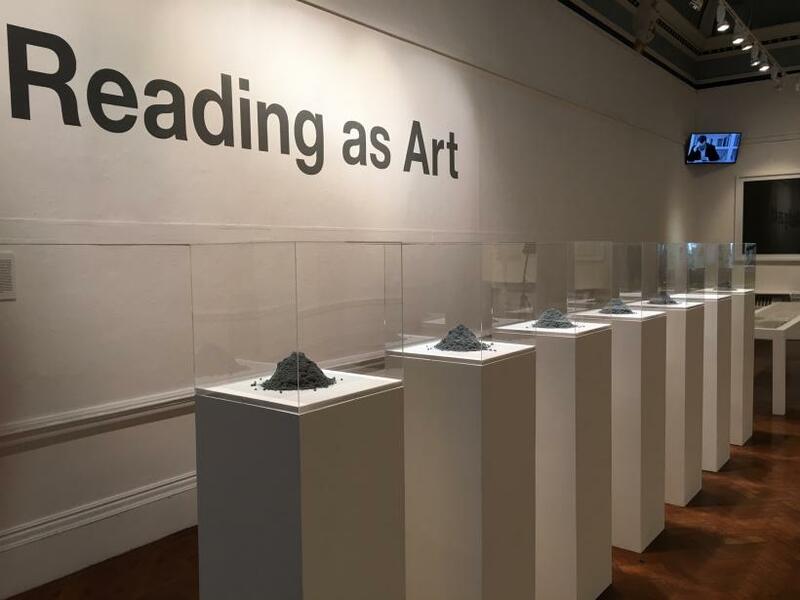 The overall first impression of ‘Reading As Art’ at Bury Art Museum, is of a fairly anaemic looking group exhibition. With the exception of the cherry tomato-red letters and symbols picked out in Himalayan wool and Chinese silk by carpet weavers, in Craig Dworkin’s ‘Fact’ (2013), the artworks appear subdued. Yet, this pallid appearance is subterfuge. The works in this exhibition rage, intrigue and unnerve. For ease of interpretation, considerately, artist and curator, Simon Morris suggests that the works may be spilt into two categories: ‘The obscenity of language’ and ‘The Infrathin’. The duality of this distinction reflects the flippant flipping of sense-making at play throughout the exhibition. The former deals with prolific and overwhelming language; an overabundance of information symptomatic of our digital age. Whilst the second set of works tackle language’s backdrop - paper; setting it centre stage. Grouping these works under Duchamp’s term, Morris alludes to the thresholds and tensions to which each artwork attends. Kenneth Goldsmith, Carol Sommer and Rob Fitterman make intersections into information overloads. Lines of language on book pages stretch along a gallery wall in the site specific installation of Sommer’s ‘Cartography for Girls’ (2016). Also included in an ‘A-Z’ style book form, Sommer has painstakingly plucked out all instances of female consciousness in all of Iris Murdoch’s 26 novels. The overwhelming volume of language is conveyed through sound in works by Fitterman and Goldsmith. The relentless faux hammering of an ersatz typewriter in Goldsmith’s ‘Seven American Deaths and Disasters’ (2016), is undeniably irritating. The staccato hammering of Goldsmith’s videos of typewriters laying out news stories letter-by-letter, punctuates and exacerbates the horror of the Columbine shootings, or 9/11, as Goldsmith retells terrible true-tales from recent history through other people’s words. Likewise, Fitterman’s audio recording of ‘No. Wait. Yep. Definitely Still Hate Myself.’ (2016); a rambling poem of self-pity pilfered from online blogs and forums grates, yet is compulsive. Swinging between the piteous and superficial self-declarations of hopelessness, the poem reveals an unexpected predictability as contemporary linguistic tropes emerge; even in the seemingly base online articulations of loneliness and desperation. The second set of works are bound by their liminality. When explaining ‘The Infrathin’ as something which could not be simply defined, Duchamp offered instead examples of its instances, including: ‘the impression formed between two sides of a thin sheet of paper.’ (Dworkin, C. cited in Morris, S., 2016, p.19) Appropriately, many of the works in the exhibition, and in this ‘set’ of works in particular, use and abuse paper. Over a period of ten years Jérémie Bennequin erased Marcel Proust’s ‘In Search of Lost Time’. 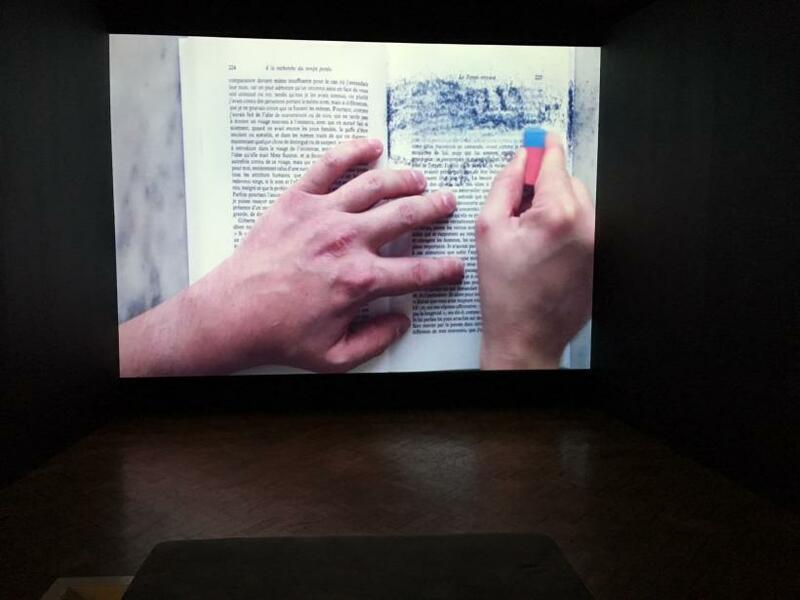 The absent is present, as the rubbings from this achingly slow erasure are presented as little mountains, made from the remnants of words; Bennequin’s ‘Mo(n)ts’ (2005-15) also gifts the viewer with a further neat play on words. Whilst the scanned and republished erased versions of Proust’s texts sit in mourning adjacent to the piles of erased words. Bennequin’s process is beautifully captured in an accompanying film by Rob Lavers, also on view in the exhibition. Many of the show’s artworks have a wonderful, wistful humour to them. 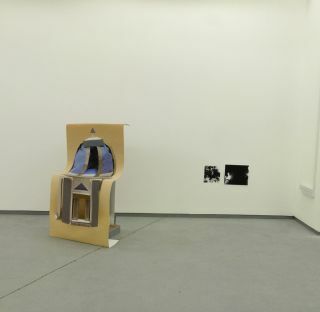 Katie Briggs offers an ode to defunct paper sizes in ‘Paper Size Poems’ (2016), and in a similarly poetical fashion Jo Hamill’s ‘Gutter Words’ (2016) seek discovery; unobtrusively installed in a corner. Nick Thurston’s ‘Erased Kosuth Concept’ (2008) eclipses the first of Kosuth’s dictionary definition series, using the photographic process as a means to obscure rather than illuminate. 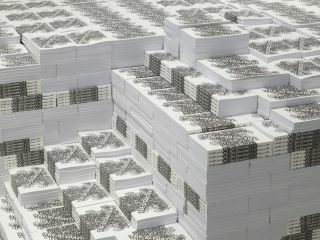 Whilst Eugen Gomringer’s ‘The emblem of my work’ (2011), presents only the paper itself and the marks made by his signature. The paradox of linguistic representation is unpicked in Craig Dworkin’s ‘Twelve Erroneous Displacements and a Fact’ (2016). Each ‘fact’ offers an unwaveringly accurate list of ingredients which make up the various components of the actual art object. The thirteenth ‘fact’ relates not to the object, but instead records the relative molecular weights of the neurotransmitters activated in a person’s brain as the work is read. This self-reflective work destabilises the certainty of the artwork as external. Further thresholds are muddied in Morris’s own ‘Reading As Art’ (2004); a performance and document of the slippage of self-consciousness in the act of reading. 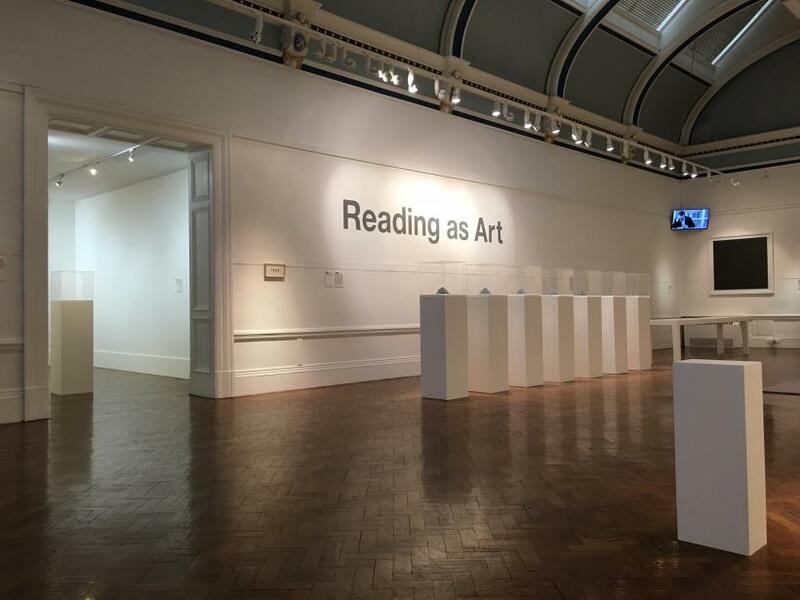 The first line of the exhibition catalogue sparsely outlines the parameters of the exhibition, ‘This exhibition explores the potential of the act of reading as art’. (Morris, S. 2016, p.9) Pavel Buchler is similarly economical in ‘Writing Lesson’ (1998), which presents a found flash card with the word ‘read’ on it. 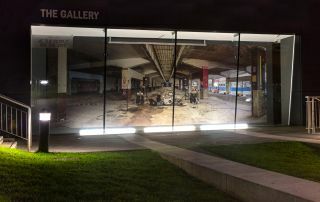 It underscores the misleading apparent simplicity of the exhibition. Such deceiving sparseness is also found in Tom Friedman and Martin Creed’s objects. 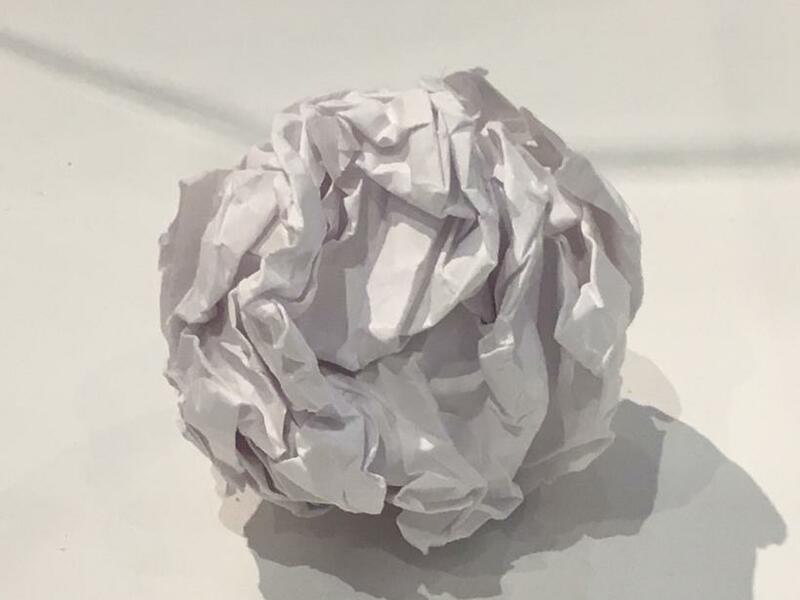 If ‘A Piece of Paper, ISO edition’ (2016); Friedman’s flat A4 piece of paper atop a made-to-measure plinth, is the space before the first word, then Martin Creed’s ‘Work no.88’ is the full-stop to the exhibition. ‘Reading As Art’ is an iceberg.